Addition of primary and secondary amines (or ammonia) to acid chloride results in amides. When treated with aqueous ammonia, primary and secondary amines convert acyl chlorides into N-substituted amides. Ammonia is a much stronger nucleophile than water and reacts preferentially with the carbonyl derivatives. The hydrogen chloride which is formed in the reaction is neutralized by addition of a base which can be the excess amine. For that matter, two equivalents of ammonia will be necessary, one for the nucleophilic attack and the second to neutralize the hydrogen chloride. The mechanism for this reaction is directly analogous to hydrolysis and alcoholysis. 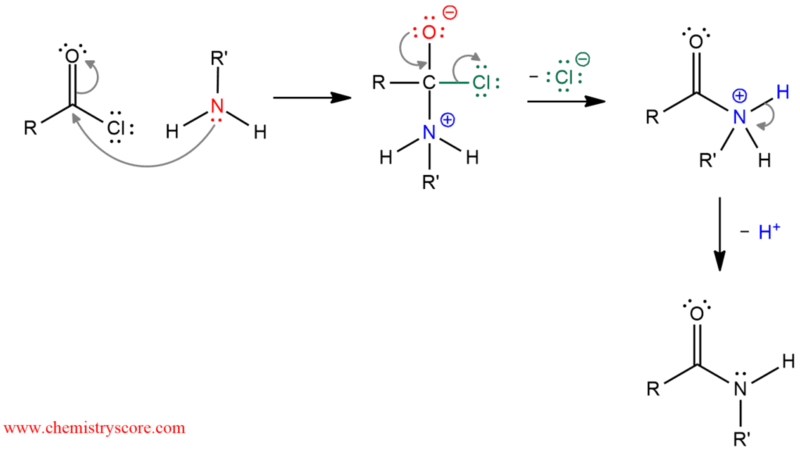 There are three steps of the addition-elimination process: the first step is the nucleophilic attack of amine to the carbonyl carbon. In the next step, by losing a leaving group the carbonyl group is re-formed. And in the last step, proton transfer removes the positive charge and the final product is obtained. Consequently, tertiary amines cannot form amides because they have no hydrogens on nitrogen.